My blog is moving to richieandsarajane.blogspot.com for all those who would like to continue reading. Thanks!! Where does time go? I am so excited and a huge part of me wants May 27th to hurry up and get here, but there is still so much to do. Luckily, this semester is coming to an end and I will be able to focus a lot more time preparing for such an important day. These past few months have been filled with appointments, searching for wedding ideas, showers, homework, more appointments, wisdom tooth removal (lucky for me, I only had one), registering, studying, tracking down addresses, working and decisions, decisions, decisions. It has been so much fun planning my wedding and I have loved every minute of it. I am so lucky to have such an amazing fiancé, who is ALWAYS there for me. I feel like there are so many little wedding details that I have stressed out about, but he is the one who reminds me not to sweat the small stuff. I don't know what I would do with out him. I am so grateful for the memories and experiences we've had together and so excited for the many more to come! 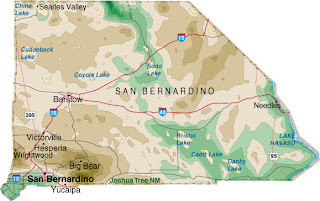 This last Wednesday, my little brother Spencer received his mission call to the California, San Bernardino mission. He reports to the MTC on June 16th. I am so excited for him! He will be a wonderful missionary and I know he will have an incredible experience. As much as I hate losing an hour of sleep when we "spring forward," I love that it is still light outside at 7:30. This past week has truly felt like Spring and I am so happy about it. I have loved the sun warming up the inside of my car. I have loved having my sun roof open. I have loved not wearing a coat everywhere I go. I have loved getting out of class at 7:00 and still having it light outside. I have loved running in refreshing air as opposed to the sweaty, muggy air at the gym. I have loved the fact that flowers will be blooming any day now. Let's hope this streak continues and we don't get hit with a big snowstorm anytime soon. This past weekend was the best weekend I have ever had. Richie and I went to St. George with his brother and sister in-law, Clay and Ashley, and their darling little boy James. We had a great time swimming, biking, and taking it easy. 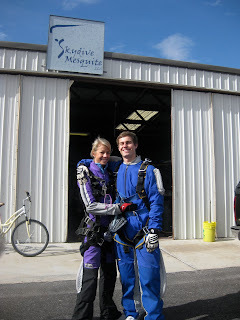 One morning we decided to go on a small "hike", but little did I know we were going skydiving. After driving for about 20 minutes, I asked Richie where we were going on this hike. He said that Clay knew of a great place and that we would be there soon. We pulled off the highway in Mesquite and moments later we were pulling into an airport. I was so confused for a minute until I saw the sign "Skydive Mesquite". 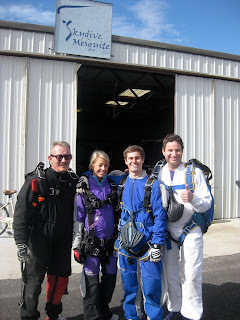 I couldn't believe I was going to be going skydiving. It is something that I have always wanted to do. We got suited up and trained and then we were on our way. Here we are with our instructors Fonz and Joe. After Fonz pulled my parachute, he said to me "do you see the sign down there?" I looked down and saw this banner from 3,000 feet above. Richie had jumped first and so by the time I landed he was there on one knee. I still can't believe how beautiful it is. After we came back from skydiving, I was surprised with a beautiful arrangement of flowers, my favorite cake, candles, Martinellis, crystal goblets, and a beautiful book. It was an incredible day that will never be forgotten. I am so excited for our future together and couldn't be any happier! I love you Richie! ::New years eve- Cafe Rio take out and a scone party at the Laird house. ::School starts- This is the last full semester I will have to take! ::Jazz games- Let's hope this winning streak never ends. ::Abby moves to NYC- One of my best friends has moved all the way across the country! ::My birthday- I feel so old now that I'm 23. Thank you to everyone who made it such a wonderful birthday! ::We brought home one of Jackson's puppies...still arguing over a fitting name. Any suggestions? ::Reading with Madeline- Every Tuesday and Thursday morning I work on reading with the cutest little girl. She is in 1st grade at the Madeline Choir School and her name is Madeline. ::Homework- I have barely found time even to do laundry these past few weeks. ::Hair appointment- I love not seeing roots. It is the best feeling! ::Weeked trip to St. George- I'm just excited to get away for a few days. ::Valentines- I think Richie and I may make a yummy dinner. ::Presidents Day- I am a very big fan of long weekends. Too bad I still have to work. I promise my next blog post won't be a month and a half away. I hope everyone has had a wonderful year so far. Happy February! I can't believe Christmas has come and gone, and that 2010 is just a few days away. I am so thankful and grateful for all that I have and all the wonderful people in my life. As crazy as the holiday season is..I love being reminded of what is important. I have had an amazing year this past year. I am so grateful for Richie and all that he does for me. He is my best friend. I don't know anyone who I look up to more than him. He is such an amazing example to me and I have had so much fun spending so much time with him since he has been home. He is so incredible. I also am so lucky to have such an awesome family. Although all 3 of my brothers are younger than I am..I look up to them more than they know. Spencer is so generous and would do anything for anybody at the drop of a hat. He loves to serve as much as he can. He will be an incredible missionary in just a few months. Sam has always been there for me. Especially these last 4 months. Sometimes our schedules are so busy that we don't see each other for a few days, but he never goes more than 2 or 3 days without coming up to my room to check on me and to talk to me. Charlie is one of the kindest people I know. He is such a peacemaker. He never has a mean thing to say about anyone and he is always making sure everyone gets included. He is so thoughtful and always thinks positively. My Dad is such a hard worker and does so much to make sure he can do more than just provide for our family. I am sometimes so amazed at how my dad knows how to fix anything. I know he reads a lot but I honestly can turn to him whenever I need something fixed no matter what it is. My Mom is not only my mom in the family but she is my sister in the family too. Since I have no sisters, I rely on her to keep me sane. Like every mother and daughter we have our differences, but for the most part she is one who I can talk to like I would talk to a best friend. I am so grateful I have the gospel in my life and that I have it as my rock and foundation. I am so thankful for the knowledge we have today. I am grateful for my amazing friends. They have always been there for me. I have been blessed with so many friends in my life and I have learned from their examples. I don't know how I got so lucky to have such incredible people in my life. Happy New Years! Today is Richie's birthday and I am so sad I can't be with him, but I will be in just two days and then we can celebrate! It will be so nice to have him back from his study abroad. He has been missed greatly. Richie is so amazing and I am so lucky to have him as my best friend and one who I can turn to for anything. I don't know anyone more kind, caring, hard working, compassionate, funny, good looking, thoughtful and smart than Richie. How lucky am I?